Alright guys, I know I only post on Mondays and Thursdays, but I thought I’d mix things up and share a little something something today. To be honest, I wanted to post this next week, but I was worried this floral playsuit would sell out. ASOS is having a huge blowout sale, and I want you guys to take full advantage while you can because prices are crazy low! 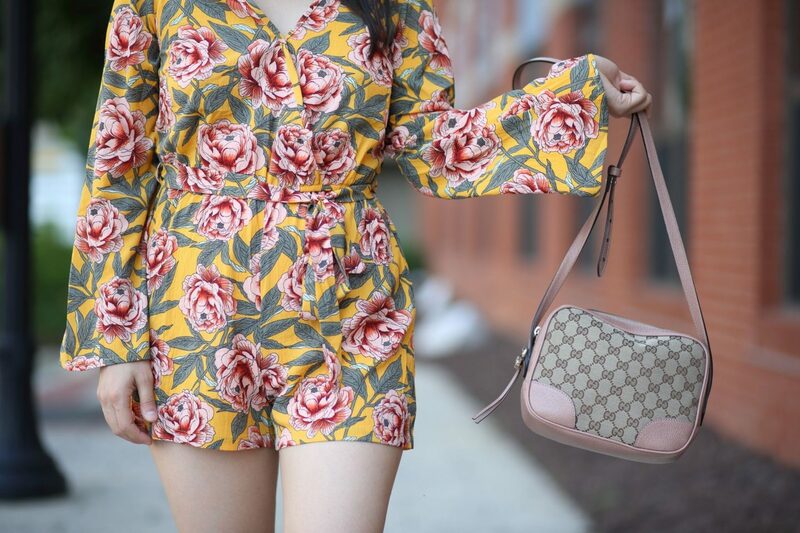 I purchased this romper for $26, and it’s still available online for those of you interested. It’s made of a polyester/spandex blend, and it has adorable sleeves that flare out! The print’s the cutest part for me though. I especially like the color combo because I’m a sucker for mustard! The romper comes with a tie waist so you can cinch it as tight or as loose as you want. It has a tiny button on the front so you have the option of buttoning it up like I did or having a more risqué neckline. I wanted to keep things casual for today’s look so I threw on matching sneakers and carried one of my go-to crossbody bags. I then finished the look off with animal print sunglasses courtesy of FREYRS. They sent them to me years ago, but I still wear them all the time. I have a pretty big eyewear collection – a few are designer but most are affordable styles under $30. I recommend investing in classic pieces that won’t go out of fashion, but don’t drop $$$ on trendy designs, unless you can afford to spend the extra cash. 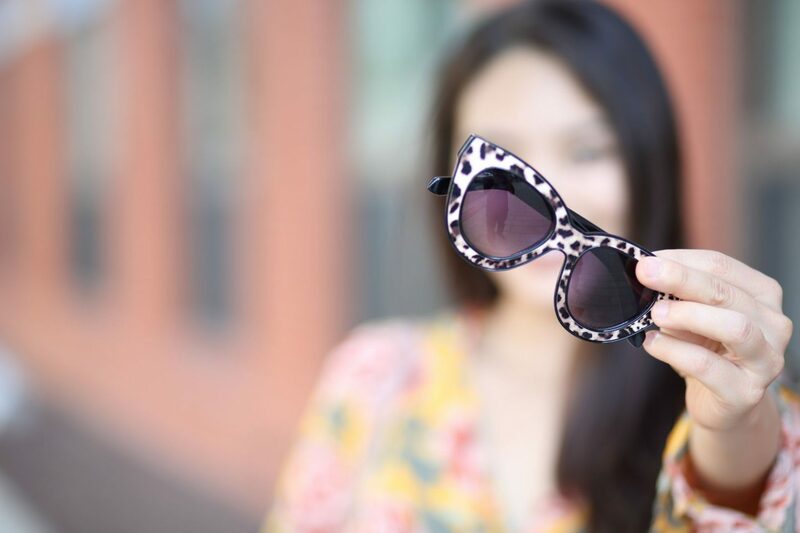 I like to save whenever possible so I find quality eyewear brands like FREYRS and Foster Grant – I did a feature on them here a while back – to purchase cute, high quality frames for a fraction of the price. Now, speaking of splurging, KOIO recently sent me these low-top sneakers, and I’m obsessed. They were made by hand in Italy and are 100% leather. This particular style’s called the Capri Fiore, but it’s available in 16 other prints/colors. At $248, these don’t come cheap, but they’re quality shoes that’ll last so if you have the moolah, it wouldn’t hurt to invest. They’re solid sneakers that look good with any and everything so you could justify the splurge with cost per wear. I chose blush because it’s a neutral that complements most shades. I also already have a pair in black and in white (different brand but similar style) so I wanted to go with something different this time around. If you don’t have either of those colors yet, white’s probably the most versatile choice. Care is difficult though, since you can scuff them up easily. If you’re a wild adventurer, maybe black is better? Anywho, let me know if you need help figuring what to get. You guys know how to reach me! And remember to come back tomorrow, friends – there will be fresh content up so you’ll want to check back. See you soon! Photography by the wonderful Sung Shin – for more casual outfit inspiration, click here. Now, that’s a floral print! And those sneakers are great.